ARE YOU MAKING PLANS FOR EASTER? We are, and we’d love to invite you and your family to spend Easter with us! On Easter, we don’t celebrate a collection of teachings. We don’t celebrate an idea. We celebrate an event . . .
an event in history that changed history. You are invited to join us on a Sunday morning soon! What will happen at the SONrise Service? We will worship together, reflect on the Apostle’s Creed, observe The Lord’s Supper and hear a brief, powerful resurrection message from Pastor Terry Smith. How much does breakfast cost? Breakfast is provided free of charge! Our awesome Deacons will be preparing breakfast for you and your family to enjoy! What will happen at the 10:45 service? The service will be jammed packed – we will celebrate through baptism, a musical drama from our Trinity kids and worship featuring our own Trinity Worship Band! There’s no dress code. Just come as you are. Childcare will be provided for infants and toddlers for the entire service. Since our Easter Service will be jam packed with powerful worship elements that include some of our Trinity Kids, preschoolers will be dismissed right before the message. If you don’t feel comfortable leaving your child in Toddler town, we completely understand. If your little one gets fussy during the service, we have the audio and video from the service piped into a space directly behind the Worship area that you can go to with your little one. Get Easter Weekend kicked off right! 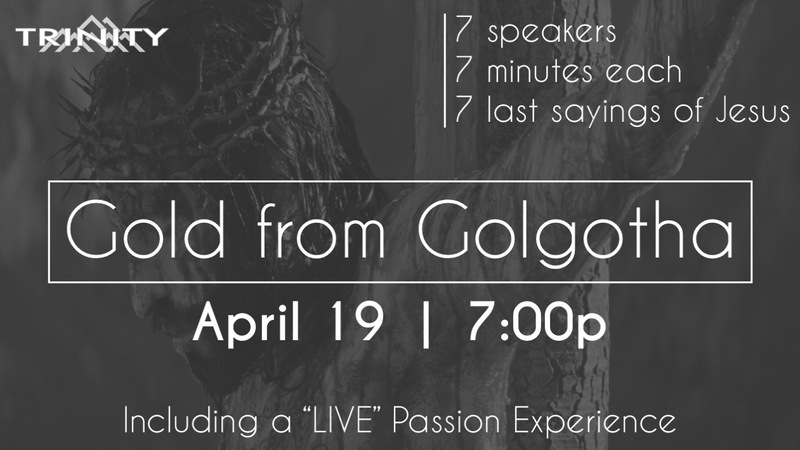 Gold from Golgotha is always an extremely powerful service as we gather with other churches and faith communtites from our area and focus on the Cross of Christ. The night will consist of powerful, Cross-centered worship, prayer, and 7 speakers preaching on the 7 last sayings of Jesus from the Cross. Childcare will be provided for infants and toddlers.